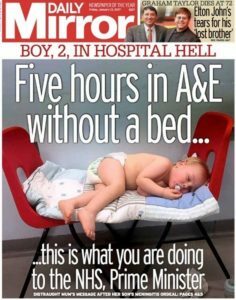 At the start of 2017, nothing highlighted more clearly the level of neglect shown by this government towards the NHS, and the risks to safety they have allowed, than this image: a sick two year-old waiting in A&E for initial assessment, including the possibility of meningitis, lying across two chairs in the A&E waiting room where there were no beds or cubicles. Two deaths were reported of adult patients waiting on trolleys in Worcestershire Royal Hospital A&E in for admission to the wards and for treatment. One patient had been waiting 35 hours before eventually succumbing still on a trolley in A&E. There is no compelling evidence to show that integration in England leads to sustainable financial savings or reduced hospital activity … The Departments have not yet established a robust evidence base to show that integration leads to better outcomes for patients … do not yet have the evidence to show that they can deliver their commitment to integrated services by 2020, at the same time as meeting existing pressures on the health and social care systems. possible given the current funding envelope. Alongside a demand for an end to racism towards patients and NHS staff, this is a clear and relevant manifesto to save our NHS. But our response was to ensure the electorate voted on the NHS and on social care – the NHS Roadshow was born the next day, set up by junior doctor, Aislinn Macklin Doherty for the Health campaigns Together, Keep Our NHS Public, People’s Assembly alliance who had staged the dramatic 4 March #ourNHS demonstration. 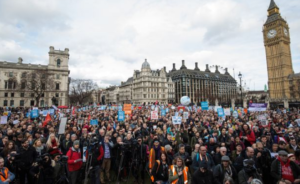 NHS Roadshow, Health Campaigns Together, Keep Our NHS Public and People’s Assembly combined once again and intervened in the General Election campaign to ensure that the NHS had a high profile. NHS Roadshow Twitter (renamed as Health Campaigns Together’s @NHScampaigns) Twitter was the fourth most effective Twitter stream on the election. And highly effective videos were put out including ‘So you’re thinking of voting Conservative’ which reached 11.5 million people. The election result was a disaster for the Conservatives and a major step forward for campaigners for the NHS and against austerity cuts to health, social care, education. The hung parliament meant that the Tories had to buy support from the Democratic Unionist Party in the North of Ireland for £1bn. Difficult and controversial decisions would be ever more difficult to push through parliament – we had made a very real contribution as NHS campaigners to the outcome of the election. Our job however was very far from done. But the relationships and alliances forged in the making of the 4 March demonstration and the NHS roadshow stand us in good stead for the future. Saturday 1 July and Wednesday 5 July saw events up and down the country to mark the 69th birthday of the NHS – a mixture of celebration and thanks to the NHS and staff and of anger and demands to government that they change direction and stop deliberate underfunding and privatisation of the NHS. Our campaigning new website went live on 24 July – with heartfelt thanks to Geoff. Notice of Hunt’s intention to privatise NHS Professionals – the in-house NHS agency staff organisation saving over £70m per year by-passing private agencies. The effective response launched by We Own It was supported by Keep Our NHS Public – see ‘September’. 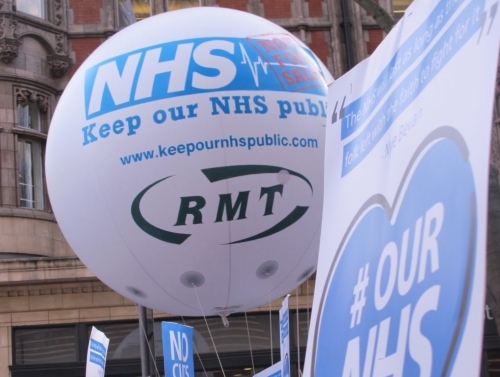 September was a boost to NHS campaigners: following We Own It’s campaign with KONP in support, Justin Madders referred the threatened privatisation of NHS Professionals to the Audit Commission. Jeremy Hunt backed down and the Department of Health announced its withdrawal of the plan to privatise. Then came the Labour Party annual conference: health campaigners, KONP activists, Socialist Health Association and LP members mobilised to get a staunch defence of the NHS and a call to end the market in healthcare on the agenda. Composite 8 was passed unanimously – this was a great day. Read more below. Simon Stevens, Chief Executive of NHS England moved quickly between December 2016 and the summer. December/January he imposed plans to deliver underfunding annually of a total to £25 billion by the end of 2020/21 – remember ‘cost control totals’ and the threat of special measures if NHS trust, clinical commissioning groups in the 44 local ‘footprint’ areas failed to ‘balance the books’ – knowing that this involved ‘thinking the unthinkable’ (literally a message given to senior NHS managers). August saw model contracts for managing the ACOs – including the explicit provision that tendering would include private companies or an alliance in the form of ‘special purpose vehicles’ notorious for being the holding ‘vehicle’ for private finance initiative contracts. There is no primary legislation allowing for this and no debate in the House of Commons had taken place nor was it planned. So – four doctors and academics announced their intention to mount an judicial review against Jeremy Hunt and NHS England. These four became ‘The Famous Five’ when Professor Stephen Hawking joined them in December. The Autumn Statement was 22 November. 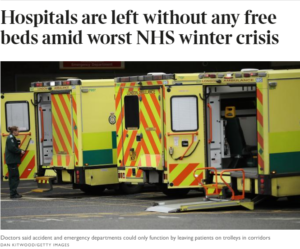 Campaigning to highlight the need for emergency funding for health and social care came from many quarters – NHS Providers, NHS England and Simon Stevens himself, the major thinktanks, Sarah Wollaston Chair of the Commons Health Select Committee and of course campaigners. The People’s Assembly Against Austerity held a rally in Whitehall at Downing St the night before to highlight the impact of universal credit vindictiveness, foodbanks and cuts to health and social care. The next day Chancellor Philip Hammond refused to fund the NHS safely and failed to even mention social care. Deliberate neglect of the NHS for eight years – over 5 years on Hunt’s watch – leaves NHS staff facing unacceptable winter pressures once again. They have been totally let down by Hunt. New Year’s Day and Cornwall’s main hospital remains on ‘black alert’ with five hour waits and not enough doctors or beds to treat patients. And Plymouth runs out of corridor space for patients on trolleys already stacked up because the A&E proper is full. We will indeed ‘fight for our NHS’ – for the care patients need and for NHS staff who need our support. Become an individual member of KONP and join one of our local groups – near 80 across England. Get your organisation to affiliate to Health Campaigns Together – with 80 affiliates including four national unions: Unite the Union, Unison, the Fire Brigades Union (FBU) and National Education Union (NEU). Together we are strong enough to win back and protect the NHS. We will force this government to change course or go – that is what it will take to restore NHS and social care funding, to end the threat of privatisation and to return the NHS fully to public service. National demonstration to mark the 70th anniversary of the launching of the NHS – 5th July 1948 – this year’s event launched once again in celebration and in thanks – but with extra significance to our defiant opposition to attempts to underfund, dismantle and put out to private contractors our very special and vitally needed National Health Service. Follow the campaigns round the country – from Huddersfield to Dorset and beyond!